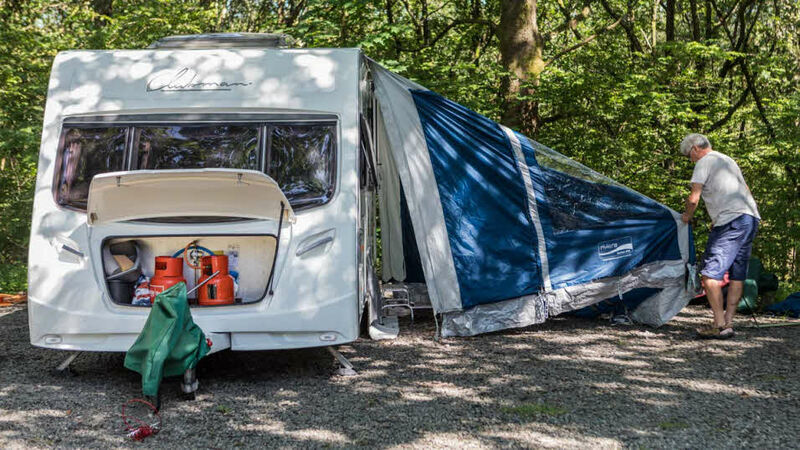 A full-size awning more than doubles the floor space of your touring caravan – providing extra room for storage and significantly increasing living space. Awnings come in all shapes and sizes, from a simple porch canopy that provides shelter and extra outside storage to a full awning with addon bedroom annexes to extend your touring caravan’s accommodation and number of berths. Awnings attach seamlessly to the caravan using a cord fastener inserted into an awning channel or rail. The awning market has seen much progress with the introduction of new materials (lightweight fabrics, composite frames), technologies (notably inflatable tubes that replace rigid poles) and design concepts that stray from the traditional square-framed, pitched roof look. The Club participated in revising the international standard for awnings, BS EN ISO 8936 (these letters mean it’s a British, European and International Standard). This grades awnings by use, with most UK models classified as either ‘Lightweight’ (L-suited to limited use) or ‘Touring’ (T- suitable for all year use but not in snow). It ensures good standards of safe design, durability and water and fading resistance. Look out for manufacturers stating that their products comply with this standard. What type of awning do I need for my caravan? Is it a sunshade/wind break for holidays abroad? Is it a place to store wet clothes and wellington boots for holidays at home? Will the family want to eat and/or sleep in the awning? Will it be put up by one person, or will several 'hands' be available? Are you restricted by the amount of weight you can carry in car or caravan? Is the awning just for the caravan you have now, or might you want to keep it for another caravan? If you want an awning that combines a sunshade with a full awning for longer stops, some products feature removable side panels. A full-size awning, tailored to fit the whole caravan side, provides the most space, but can be very heavy. Porch awnings offer limited space, but are lighter and easier to handle. If you plan to use your awning frequently it needs to be durable. In winter, it will need high levels of weather resistance. Occasional summer-use awnings may feature a lighter construction and be lower in price. What size awning do I need for my caravan? The key measurements you need to know before choosing are the total length of the awning rail and the height of the caravan floor above ground. To calculate the exact length of awning, make sure the caravan is level and thread some nonstretch cord up through the awning channel so that it reaches the ground on both sides and measure this. Most awnings will offer around 10cm of leeway from its quoted size, but if in doubt study the awning design below carefully against your caravan shape, to decide whether it would be better to opt for a size up or down. The sizes tend to go up in increments of 25cm and heights are generally from 2.0m to 3.5m. If choosing a porch or half awning, make sure the portion that runs vertically down the side of the caravan does not foul the refrigerator vent or window. Acrylic, polyester or cotton tends to be the choice, and some awnings have the roof made of one material and sides of another. Acrylic is generally considered to be superior, as it does not shrink, rot or fade. However, it is more expensive and sometimes prone to condensation, whereas cotton 'breathes'. Polyester is not as hardwearing as acrylic, but has some of the breathability of cotton. Look for precision stitching and generously cut seams with reinforced areas around zips, windows and doorways. Nylon zips are now the industry standard. Spiral zips give a smooth action especially round corners. Remember that light colours tend to reflect more heat than dark colours and generally give a light, airy impression. If the awning is likely to serve as an extra bedroom, a darker shade may be a wiser choice. A traditional frame tends to provide more usable internal space but is usually heavier and more complex to put up. A lightweight frame (often featuring flexible poles, as in many modern tents) can mean limited headroom in some areas. An inflatable tube awning is easy to put up; shapes are varied – some are rounded while others are more like a traditional awning. The mudwall protects the canvas from wet and dirt and generally extends into a rainwater skirt. However it may not be as robust as the canvas, so take care not to stick pegs through it, tread on it or tug impatiently at it when erecting the awning. Never use it to help remove pegs from the ground; either use an upturned metal peg or a proper peg extractor. The skirt can either be pegged to the outside to deflect water or inside, tucked under the groundsheet, to prevent draughts. We recommend you use groundsheets that allow the grass to 'breathe'. Whilst these will still have to be lifted from time to time, damage to the grass is less severe than with conventional groundsheets. Any type of peg similar to our standard rock pegs (in essence a hardened nine-inch nail, approximately a quarter-inch diameter) would be acceptable, but we do not approve of pegs that are substantially greater in thickness or in length because they are capable of causing loosening and damage to the foundation of the pitch. 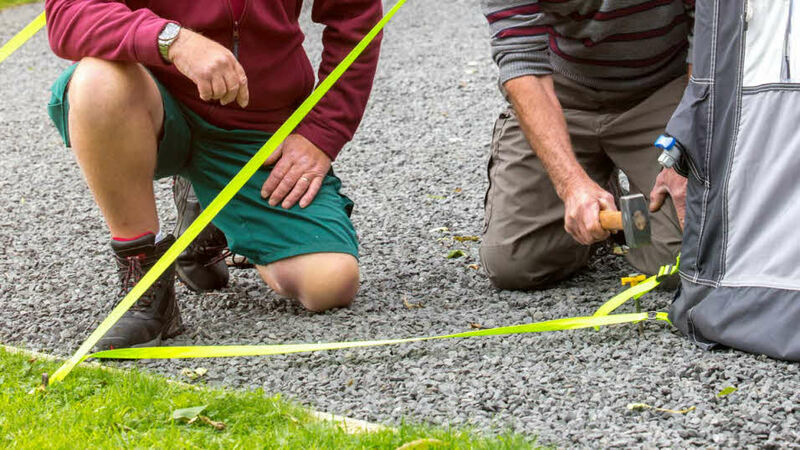 The design of a hardstanding pitch has to offer a balance between a stable enough surface to support a caravan, including the point loads created by jockey wheels when being manoeuvred by motor movers, as well as a surface that’s loose enough for pegs to be driven into and removed easily. The surface also has to be able to hold pegs securely during high winds. Site wardens will normally have some in stock available for purchase. If there is too much slack in the awning roof, water and snow could pool and saturate and damage the awning fabric. If you are likely to be using an awning in these conditions, choose one that offers additional roof supports to keep it taut and look for a more steeply sloping roof that will discourage any water or snow from collecting. Cotton awnings need to 'weather' before becoming fully waterproof, so bear this in mind when first using. A few heavy dews, or a day of persistent drizzle is probably sufficient to swell and 'seal' the cotton fibres, but it’s a good idea to set a new awning up in the garden and soak with the garden hose (and let dry) before you go. The golden rule is never to pack an awning away when wet or even slightly damp, or mildew will result. It should be stored in a dry, well-aired place; the caravan is fine in summer but too damp for the winter. An attic is ideal, or even a dry garage providing the awning is kept off the concrete floor and out of reach of vermin. Store poles and canvas separately and although you can wipe steel poles with a lightly oiled cloth to prevent corrosion, all traces of oil must be removed before the poles come into contact with the awning again. Always wait until the canvas is dry before dealing with mud or dirt, when it can usually be removed with a stiff brush. Stubborn marks can be tackled with plain water, but anything stronger should be avoided if possible. If too unsightly, try soap and water but never detergent. Any area touched by the soap solution will have to be reproofed. Specialist cleaners are also available. Your awning will need regular reproofing – ideally every season. Small patches can be treated with an aerosol proofer and should be applied when the awning is dry and in a well-ventilated place. For larger areas use a soft paint brush. Ideal conditions are a warm, dry day, but avoid hot sun which will dry the proofer out too quickly. Do not forget to protect vinyl windows, mudwalls, grass and tarmac while using products which contain spirit-based solvents. Do not pack the awning away until the solvent has completely dried out.